Wheat (species of Triticum) is a cereal grain. People eat it most often in the form of bread. It is a kind of grass whose fruit is a "head of wheat" with edible seeds. It was first grown in the Levant, a region of the Near East. Now it is cultivated worldwide. World trade in wheat is greater than for all other crops combined. Globally, wheat is the leading source of vegetable protein in human food. It has a higher protein content than other major cereals such as maize (corn) or rice. In terms of total production, it is second to rice as the main human food crop and ahead of maize (maize is used more for animal feeds). Wheat was a key factor enabling the emergence of city-based societies at the start of civilization. It was one of the first crops that could be easily cultivated on a large scale, and its seeds could be stored for long periods in a dry climate. Wheat helped the growth of city-states in the Fertile Crescent, including the Babylonian, Assyrian and persian empires. Wheat grain is a staple food used to make flour for leavened, flat and steamed breads, biscuits, cookies, cakes, breakfast cereal, pasta, noodles, couscous. It can also be fermented to make ethanol, for alcoholic drinks, or biofuel. An allergy to wheat can cause coeliac disease, which makes the sufferer have diarrhoea if they eat any food containing wheat. The wheat plant has long, slender leaves, stems that are hollow in most types of wheat plants, and heads that have many kinds of flowers, from 20 to 100. The flowers are grouped together in spikelets. Each spikelet has two to six flowers. In most spikelets, two or three of the flowers become fertilized, and this makes them produce the grains used for food. Emmer wheat (Triticum dicoccum), or 'hulled wheat', is a type of awned wheat. It was one of the first crops domesticated in the Near East. It was widely cultivated in the ancient world, but is now a relict crop in mountainous regions of Europe and Asia. In the wild, the awns of emmer wheat spikelets help them dig into the soil. With humidity in the night, the awns of the spikelet become erect and draw together, and in the process push the grain into the soil. During the day, the humidity drops and the awns slacken back again. During the course of days and nights, the awns' pumping movements drill the spikelet as much as an inch into the soil. Einkorn wheat is one of the earliest cultivated forms of wheat, (Triticum monococcum). Grains of wild einkorn have been found in Paleolithic sites of the Fertile Crescent. It was first domesticated about 7500 BC (~9000 years ago), in the early Neolithic period. Evidence from DNA suggests einkorn was domesticated in southeast Turkey, where a number of early farming villages have been found. Its cultivation decreased in the Bronze Age, and today it is a relic crop that is rarely planted. It has found a new market as a health food. It is still used for bulgur (cracked wheat) or as animal feed, in mountainous areas of France, Morocco, former Yugoslavia, Turkey and other countries. It often survives on poor soils where other species of wheat fail. 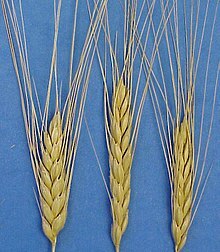 Einkorn was domesticated at the same time as emmer wheat, but was not so important. ↑ Nutrient data laboratory. United States Department of Agriculture. ↑ "wheat (plant) -- Britannica Online Encyclopedia". britannica.com. Retrieved 29 April 2010. ↑ Elbaum, Rivka et al (2007). "The role of wheat awns in the seed dispersal unit". Science 316 (5826): 884–886. doi:10.1126/science.1140097. PMID 17495170. ↑ Heun M. et al (1997). "Site of einkorn wheat domestication identified by DNA fingerprinting". Science 278 (5341): 1312–1314. doi:10.1126/science.278.5341.1312.